For most of us, preparing for Christmas is generally done in December, or if we’re extra-organised, perhaps November – but for Chris Goodman, festive planning has become an all-year-round task. As long-standing Chairman of the super-successful Brighstone Christmas Tree Festival, there is never a month when he isn’t thinking, writing or talking about decorated trees. So how did he become Brighstone’s “Mr Christmas”? Jackie McCarrick has been finding out. It has become something of an Island institution, helping to put the village of Brighstone on the map, and attracting crowds of enthusiastic festive visitors by the coach and car load. Indeed, people come from the mainland as well as from all corners of the Isle of Wight, to experience this bustling, bright and uplifting annual Christmas event. Back in 1997, the organisers of the first little festival at Brighstone Parish Church could never have dreamed how their home-spun event would turn into such a big festive phenomenon. The festival was started by the then Rector of Brighstone, Revd. 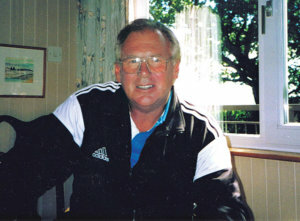 Tim Eady – who might have had something of an affinity with fir trees, since his parents owned a Christmas tree farm! 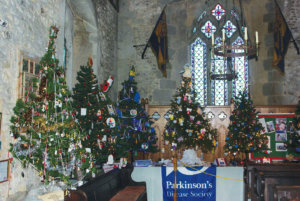 On his travels, he had come across a small-scale Christmas tree festival at a church in Northamptonshire and thought it might be good to introduce to the church at Brighstone. 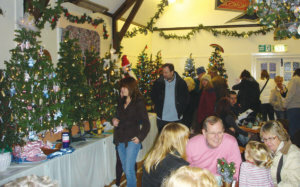 And so it was that in the first year, a total of 25 trees were displayed in the church and the village’s Wilberforce community hall – the idea being for each one to represent a different community group, business, charity or individual. Within the first 4-5 years, the festival expanded so rapidly that it became established as a popular calendar event, and it’s continued to grow year-by-year, with new venues being added to display the trees and give visitors more to enjoy. Fast-forward to this year and the festival covers eight locations, with a combined ‘forest’ of 220 trees on display, plus an additional 30 trees decorated by children. Former Rector Tim Eady – now thousands of miles away and running an Anglican Church in Bangkok, Thailand – would probably not recognise the Brighstone festival of today, says Chris Goodman. For Chris, a retired financial advisor, the festival went on to become not only a consuming passion – but also something of a personal life-saver. He’d been involved in the event for a couple of years as a member of the Brighstone church congregation, and was asked to take it on as organiser in 2004, when the Rector moved away. Prior to that, Chris had taken early retirement from his job on health grounds, and after a period of recuperation, was looking for positive ways to spend his time. “I overdid things at work and ended up having a minor crack-up” he explains. “It was pretty awful and I can sympathise with anyone who goes through the same thing. It took me about nine months to recover, and at the end of that, I opted to take early retirement”. He had planned to retire early anyway, but at 49 he clearly still had plenty to give – and decided he wanted to give it in terms of service to the community. A regular churchgoer at Brighstone, he started by taking on a voluntary treasurer role with Christian Aid which he credits with “bringing me back into the world”. He had also been touched by hearing about a little girl from Ryde – Kerry Green – after her diagnosis with a rare form of terminal cancer. “I just couldn’t seem to get this little girl out of my mind, and when I heard that her biggest wish was to swim with dolphins in Florida, I got involved in setting up the Kerry Green Trust”. He was thrilled by the number of Islanders who got behind the Trust and made it possible for Kerry to have her swimming with dolphins dream come true within weeks – and within a year, for a dozen other children facing life-threatening illness to see some of their dreams realised too. Chris finally stepped down as a trustee of the charity and handed over the mantle after his fellow-trustee and close friend Ray Close passed away. “I guess I was looking for something more joyful to do at that point – and the Christmas Tree Festival was certainly that!” he says. In fact, as the event has grown, so has the amount of help and support it receives, and now in addition to the committee, there’s a huge team of around 100 volunteers, as well as members of the community who get involved in various ways. “Over the years I think it’s fair to say that the festival has boosted the community spirit no end” says Chris. “We get tremendous support from the commercial sector, too, and I now count many of the business owners as good friends. There’s such generosity out there and people genuinely want to help. As the scale of the festival has grown, so has the workload – not that Chris is complaining, it just means that he needs to be super-organised to keep on top of everything. As soon as one festival ends each December, he swings into his January tasks of financial accounting and the distributing funds to many charities, as well as writing thank-you letters ad sending ‘certificates of thanks’ to the many sponsors. “By February people are asking for the next year’s dates, and so it all starts again!” says Chris, who draws up a checklist of tasks for every month of the year in order to spread the load – “and to make sure that I’m not panicking about anything in November”. Apart from checking in all the exhibitors, he designs and publishes the programme, liaises with venues and sponsors, and produces the nameplate for each tree. He says he loves the fact that the trees offer “a snapshot of Island life”, with their decorators ranging from schools and sports centres to charities such as Freshwater Independent Lifeboat and Riding for the Disabled, to organisations as diverse as the Wight Aviation Museum and the Beach Cleaning Volunteers. Trees range from the strictly traditional to the outrageously quirky, and have previously included a tree made by local Scouts from crushed Cola cans, to one adorned with miniature cardigans fashioned from sterilised dog hairs, by the Island’s Guild of Weavers, Spinners and Dyers. Then there are the stunningly simple ideas, such as the tree decorated with laminated autumn leaves or another festooned with brightly-coloured knitted garden birds. 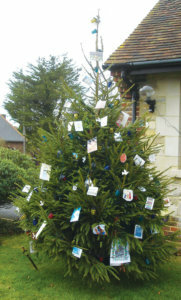 One of Chris’s favourites – for obvious reasons – was the ‘Raise The Roof’ tree entered by a local family to support and draw attention to Brighstone Church’s £90,000 appeal for a roof repair bill. With great ingenuity, the designers attached a huge church spire to the top of their Christmas tree, complete with working clock and stained glass, all held in place with wires to the ceiling. It’s hardly surprising that visitor numbers to the festival rise each year, and that increasingly, they include holidaymakers who enjoy the event as part of their festive ‘Turkey and Tinsel’ breaks. The sheer logistics of accommodating so many visitors in one small village have been addressed by introducing park-and-ride services, and extending the number of venues over a wider area, to include Mottistone Church and the Isle of Wight Pearl. Asked if he could imagine the event going Islandwide, he’s not so sure: “I think that would spoil it” he says. “There are now some similar, smaller festivals in churches elsewhere and that’s the biggest compliment people can pay us – but our event is unique and I think we’d like to keep it that way. “Brighstone is a beautiful village and I’m very proud that we started the festival”. Apart from providing a lovely, joy-filled beacon of light in the darkest days of mid-winter, the Christmas Tree Festival has also raised an amazing total of £120,000 for over 100 different Island charities since it began. The first year’s total was around £2,000, but by last year it was in excess of £11,000. As the event itself is free to enter, and gives out 10,000 free programmes, all the funds raised come through voluntary donations, and sales of refreshments. Even after so many years at the helm, Chris still finds the festival utterly heartwarming: “The faces of not just the children but the adults too, are always something to behold” he says. * The festival runs over the weekend of December 6-9 and remains open for viewing in three venues until December 31. See the festival website www.bxtf.org for details.